Penny Arcade turned ten this week. They didn’t do anything special for it – a casual mention or two amidst a flurry of newsposts on all manner of other things. Those other things are rather telling, however – posts on Child’s Play, on Greenhouse, commentary on various games and gaming-related material. The sheer amount of accomplishment and influence they have is phenomenal, and makes Penny Arcade far more than a simple webcomic – and yet, the creators remain humble, and diligent in their work. They have continued to improve over the last decade, despite how easy it might be to simply indulge in their success. I still find myself sitting around with my friends, and someone will quote a recent strip, and then a dozen more quotes will erupt from the crowd. They need no explanation, no context – Penny Arcade is a shared experience, and a few simple words are enough. “I vant you to keel seex snow moose,” indeed. Meanwhile, interesting things are afoot at PvP. I was recently talking with a friend about the strip, and he expressed dissatisfaction with it of late. For myself, while I couldn’t recall being impressed with many recent story arcs (and while I had been disappointed to once again see Kurtz acting like a child on the interwebs), I found the strip itself still holding my attention quite well, and the stand-alone strips were maintaining an excellent level of humor, often trying new things with his oldest jokes – without abandoning them entirely. And then, this week, we got the start of a new storyline – and one I couldn’t wait to see unfold. Max and his interaction with the crew have always been some of the most interesting scenes to me, even since I read a certain Websnark article that quite effectively pointed out that Max Powers (constantly shown as the antagonist)… was actually the good guy. So this week starts with a promising premise – a chance to really delve at the underlying frustration between Max and the PvP crew. And it sets up the scene extremely well – we see the ever-smiling Max Powers, confronted by the usual hostility, finally stop smiling – and ask, point blank, why Brent and Cole don’t like him. It humanizes Max in a way the strip rarely is willing to do – and that’s the interesting part. Sure, it is easy enough to realize that Max isn’t actually as bad a guy as Brent and Cole present him as, but the strip isn’t never points that out – it presents him as the villain time and time again! So what does it mean when it takes a step back, and presents him as a real person? Let’s us see the human side of him directly, and makes that central to the storyline? I’m eager to find out, and yet I’m also worried. Kurtz has shown before that he can pull off this sort of thing extremely well – many of the story arcs about Brent and Jade have walked this edge and come out triumphant in the end. But at the same time, some of the more recent character-centric storylines… about Skull, and Francis and Marcy… have been rather hit or miss. The last few days in this arc have had their share of interesting revelations, but I’m willing to see how it all plays out before giving final judgement. But regardless of how successful it is, it is still something I’m glad to see Kurtz willing to try. There is a fear that certain comics will stagnate. Will go the route of the newspaper strips, and focus on the same tired jokes for years on end, without ever risking change to what has been a successful formula. PvP could end up like that – it passed its ten year mark just in May. But Kurtz is unwilling to risk that fate, and wants to let the characters grow, even with the risk, even without it being guaranteed success. He’s experimenting, here, with a proven element of the strip – Max Powers as Cole’s foil, Cole’s rival, Cole’s counterpart. He is a very easy character to use, and a very powerful tool in the strip’s arsenal – and Kurtz is risking that tool losing it’s ability to function, in return for the chance to make it something even better. I might not end up liking this arc, or I might end up loving it. But either way, I’m glad to see Kurtz still willing to take that chance, and push his comic past its boundaries, and into the brave new world beyond. So… this week has certainly been full of excitement. While history has been busy defining and redefining itself around me, I’ve been busy getting a head start on falling behind on NaNoWriMo! The reasons for this have been reasonably varied, from the usual gaming to the election excitement to finding myself attending a performance of Waiting for Godot. And, of course, thanks to the recent release of Episode 2 of Penny Arcade’s On the Rain-Slick Precipice of Darkness. Having finished the game yesterday, I found it much the same as the first one – some slight mechanical refinements, certainly, but the same animal as a whole. Which is to say, an immersion into the humor of Gabe and Tycho for hours on end. There is nothing else to it, and there does not need to be. Indeed, it is an amazing triumph that they can take the same humor usually parcelled out in small doses thrice weekly, and unleash it in a maelstrom of absurdity, vulgarity, and surreality that goes on for hours! Penny Arcade advertises it as “A Completely Ridiculous RPG Adventure” – that is about as accurate as one can get, in all the right ways. But it might be that my sense of humor is suspect. Perhaps all the chaos and calamity of current events has left me unable to discern what is true entertainment. Indeed, I found I had laughed – out loud – at the latest Ctrl+Alt+Del. How does that come to pass? Well, that’s a poor example – I know precisely why. 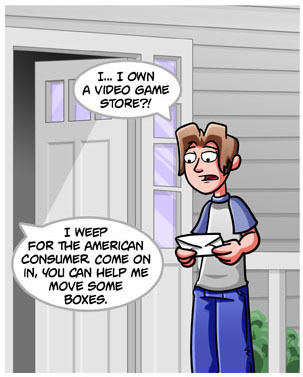 I said, a long time ago, that whatever my opinion of Tim Buckley, I found Ctrl+Alt+Del a perfectly reasonable comic – nothing amazing, but competent enough in its own right, with a single exception: Ethan. Ethan, you see, was crazy. He was a miserable failure of a character whose only defining characteristic was that he acted in a fashion no human being would ever consider acting in, and was typically rewarded for doing so. He got an easy job, he got the cliche geek girl, his friends never actually permanently remained upset when he caused them physical injury or destroyed their property… and so forth. I haven’t been a fan of the latest storyline. I haven’t particularly liked the comic’s treatment of Lilah, the main female character. I found the twists and turns of the storyline itself to be poorly chosen. But the other day, I laughed at the strip, ever so momentarily. I found the previous strip actually, genuinely touching, in spite of all my reservations about the storyline. And I realized why – Ethan was acting like a real person. Oh, he was still zany and silly and not entirely connected with reality – but he seemed to have an actual connection to the world around him. He was connecting with Lilah, he was about to carry on reasonable conversations with people – and his interaction with his former boss seemed like an entirely real human interaction. It might seem strange that, after praising how over-the-top and ridiculous the Penny Arcade humor is, I go on to state that CAD’s greatest accomplishment is in stepping back from its absurdity and bringing one of its characters down to earth. But… Penny Arcade has been about the absurdity of the entire universe in which those strips occur, while Ethan has simply been about being silly for the sake of being silly. Penny Arcade occasionally dips into dread continuity, but largely focuses on little capsules of humors three days a week. CAD has become more and more of an ongoing story – which doesn’t work if the audience can’t stand your main character. But make the main character a bit more real? Make it a figure in which they can become genuinely invested in? Whether Buckley will keep it going, or whether we’ll deserve back into the usual antics, is hard to say. And there are plenty more areas of the strip in which there is room to improve – but for the longest time, I’ve been wondering why I kept reading the comic. This week, I actually had an answer. For the vast majority of my life, I have paid very little attention to current events. If I read a newspaper, it was only for the comics. Even when I became an internet junkie, checking out the latest news was the last thing on my list – my awareness was entirely on the world around me, on that which had specific relevance to me, and not on the world at large. Sometime in the last year, that has changed. In part due to the US election, obviously an important upcoming event. In part due to the various problems the world seemed to be going through – things of which I had always been tangentially aware, but largely oblivious to. Whatever the reasons, I have found myself reading news stories and trying to stay informed. Of all the reasons to be glad to have done so, I did not expect one of them to be a keener appreciation for Sinfest. I’m sure I’ve mentioned my renewed appreciation for Sinfest several times over the last two years, ever since it underwent a pretty thorough evolution – adding incredibly gorgeous and elaborate Sunday strips, having a more subtle change to the core art style… and in general, renewing the humor and imagination of the strips. For the years prior it had gotten into a rut, returning often to the same jokes, same punchlines, same concepts. Now, it started to… expand. To return to the habit of looking at things in a new light, and exploring philosophy and parody in equal measure. And these last few months, it has done a fantastic job of both. Politics and the economy have been, unsurprisingly, on the agenda. And Sinfest is hardly alone in this – many strips, these days, are quick to take a shot at such topics. But with most comics… the attempts to do so aren’t funny, aren’t clever, and can even be actively frustrating to read – regardless of which side the webcomic is on or what opinion it has to share. Far too many are simply mean-spirited, or bitter, or angry… and without any insight that might really justify such emotions. Without any reason to make those comics worth my while. Sinfest, though, has poked its fun with elegance and grace. And the reason why, as far as I can tell, is that despite having a very clear bias in what the strip is saying, it manages to say it all in fun. Portraying the presidential race as a rock show performance, showing a glimpse of emo Uncle Sam, and showing tough times for various cartoon icons… it all works, and works well. It is solid, effective commentary on the election, the nation, the economy – but manages to still have a sense of laughter, of lighter thoughts. The strips are focused on some very dark, very depressing topics – but it manages to keep an upbeat spirit despite it all. Now, I’m sure this comes as no surprise – the attitude of the strip has always shown that Ishida, the strip’s creator, has long understood that one of the best ways to deal with a tough topic is to laugh at it. But his real accomplishment is not just in doing so himself, but sharing that same sentiment with all his readers, and providing a small shining moment of awareness each day… a small little bit of humor to provide a short smile or brief laugh or simply a grin at the absurdity of it all. 1) Delivered the promised post on Starslip Crisis the weekend I proclaimed I would… or anytime within the next month, or even the month after that. Or, in the end, at all. 2) Followed through on my claim from the month before that, even in the absence of proper content, I would post at least one brief update each week to keep the blog from vanishing into the dreaded indefinite hiatus. As, in fact, it did. 3) Live up to my goal to, if nothing else, keep open a line of communication with my readers, since I have always proclaimed that while constant and regular updates are nice, they are not the most important thing, which is to keep readers informed on when updates would be… and when they would not be. As, of course, I have failed to do. I’m not altogether pleased with my failings in this matter, and I’m sure my readers are even less so. and while it is a disappointment that I’ve fallen behind in not just my writing here, but all my writing and creative work in general, it is even more of a disappointment that I retreated into absolutely silence, rather than even given an indication that posting was likely to be absent for a while. That has always bothered me when I’ve see it done, and now I find myself just as guilty. I can offer little explanation nor can I give a guaranteed date when my posts will return to their former abundance. All I can say is this: I resolve to do better in the year to come. Have I been ill/dying/dead/suffering amnesia on a desert island? No, I can’t say I have. No major illnesses have struck me down during my absence, though I have been plagued by a thousand petty annoyances and frustrations, each one more bothersome than the last. I have a particularly amusing story to tell about how the very medicine I was taking to combat one afflication did, itself, traumatize me even further – and when I solved that problem by cutting back the dosage, and decided to compensate by increasing my fruit intake as a home remedy for the original problem, I thus discovered that, as a matter of fact, I’m allergic to a wide variety of fruit. I fnd myself taking drugs for blood pressure, which has always been a danger in my family. I find myself being warned about cholesteral and other elements of my diet in need of fixing, and so I have been working on eating healthy and adding more exercise to my schedule, even as my responsibilities at work grow ever more hectic – which, I suspect, is not exactly helpful for any blood pressure concerns. Yet I am, by any genuine standard, healthy. Allergies and diet concerns and the hustle and bustle of life are no more than the norm, challenges intrisic to the walk of life, and I am threatened by solely these such minor vexations, which merit only the complaint I have given them thus far, and nothing more. Have I lost interest in the ways of comics? On the whole my interest remains. And in many ways, I am pleased to say, the comics that stand out are the ones that excel and continue to surprise, with brilliant plots and gorgeous art and characters I feel genuinely connected to, rather than frustrations over comics that have failed to live up to their promise or proven a disappointment in some way. Which is a good thing, since that was the original goal of this blog – to focus on the accomplishments, and recognize work done well. Yet… in my webcomic queue on Piperka, I’ve got well over 2,000 updates floating in wait. Oh, the majority of those are from a few dozen comics I’ve fallen behind on over the last few months… but it has become a trend. Many comics I’ve always followed because they were “good enough” for me… are no longer. I’m willing to follow the best of the pack, but I don’t have the time or motivation any longer to keep track of the rest – let alone to go hunting through new ones. To all the many souls who have sent me comics for review: I appreciate the sentiment, and would certainly love to take a look at all the ones presented to me, but I’ll tell you know – don’t hold your breath. And unfortunately, as my reading list does drift towards focus on a smaller section of quality comics… it also means it is focused on comics I have reviewed before, and talked about all that there is to talk about, so long as they keep the quality at the same level of excellence. Simply writing a post to say, “Hey, this update was just as awesome as all the rest!”… well, it only goes so far. In spite of this, I do have things to talk about. In the last few months, I’ve seen several of my favorite comics come to an end, and some came to an expected conclusion in a satisfying fashion… while others simply stopped. Webcomics has had the usual share of drama, and somewhat more than the usual share of theories on how to make a living from it – and while many of these discussions are over, they are sure to crop up again, as they always inevitably do. So in summary – yes, I plan to continue writing. I’d like to say I hope to get regular posts started back up within a week or two. (Likely the ‘two’, as I am largely without internet access in the upcoming week.) And I’d like to say that I do have a wide variety of topics on which I’d like to share my thoughts in the usual rambling fashion. But given my past few posts, I think any specific promises of content may well be met with disbelief… so I’ll simply say that is the plan, and let the future bring what it may. Update will be late this week, but I’ll try and have something posted this weekend. I am quite eager to take a look at Starslip Crisis, which has been going full throttle with awesome plot – perhaps in part because Kris Straub has an entire seperate strip devoted to humor alone… and that strip is also Starslip Crisis. Anyway, a deeper look at this – and the rest of Straub’s comics – sometime this weekend! I was somewhat miffed When I saw the start of this week’s episode of PvP, Skull the Troll. In part, perhaps, because Scott Kurtz had just been involved in a minor webspat with D.J. Coffman over the same sort of parody that Kurtz is, here, engaging in. I largely was on Kurtz’s side in that incident, even as I felt he was being hypocritical given some of his own behavior in the past… or the present, as the case may be. Once the Foxtroll strip entered the mix, on the other hand, I found myself enjoying the storyline, especially as another piece in the continuing saga of Skull. And this strip was pure genius. And… that’s really all I have to say about that. Skull’s adventures as an imaginary friend to children are interesting, but I do find myself hoping that he actually gains something out of it. PvP develop’s characters slowly, but it does get them there in time – and the rest of the crew have gone through some big changes lately, while Skull has been left behind. And whatever happened to Sonya Powers? You know… Skull’s girlfriend? That looks likely to be the case, as the free downloads available via Wowio are, in fact, no longer free. Readers can purchase those downloads, certainly, but the presence of essentially free money for the creators is no longer there. The new Wowio does have its products available for free reading online, though I have to imagine the creators are no longer receiving the same compensation they did for the downloads. Which… is a shame, but not entirely surprising – the previous business model seemed quite handy for creators and readers, but not altogether sustainable. Also: The display reader used for viewing the work online is pretty bad. One day, these people will figure it out and get rid off these things… or come up with one that actually works. So apparently, over a month ago, Saturday Morning Breakfast Cereal added a little red button. This button is found just below the main comic, on the right, and mousing over it reveals a follow-up panel for the comic itself. It is essentially alt text taken to the next laugh, and adds yet another laugh onto a strip that is already pretty good at multiple punchlines. However, the appearance of the button only received a short mention in the comic’s news, and then went unremarked upon… resulting in my lack of knowledge of the button until yesterday. At which point, of course, I had to read back through the archives and check the button each day, to see what I missed. So I felt it fair to pass on word of the button, rather than let others suffer the same failing as myself. So go! Check out the red button! Enjoy extra comic goodness! It is my opinion that Sorcery 101 has been exceedingly good as of late. The interaction between Danny and his daughter has long been a highlight of the series, and the latest storyline has only underscored that. And the latest events – in which Danny plans to use magic to fix his daughter’s health problems, only to learn they are, in fact, caused by magic – has had me more interesting in the series than pretty much any time previous. But I probably wouldn’t have mentioned it if it wasn’t for a post on the Girl-Wonder forums that points out precisely what “disease” she is coming down with. See, Natalie has been having migraines and other concerns, which we discover is due to her latent magical power being bottled up and not having any form of output. The solution is to train her in magic, in which she will be naturally adept due to her situation – but this carries its own downside, as this may also make her arrogant or worse. It is also mentioned that most such individuals have purple eyes. Now, at this point, I had bought the story hook, line and sinker. This was a serious discussion, I was seriously concerned for poor Natalie, and it didn’t even remotely occur to me to look past the surface of the story at hand. But once the true tragedy was pointed out, I honestly couldn’t stop laughing. It is rare that a comic can work on two such distinctly seperate levels at the same time. Kel McDonald managed to pull it off with perfect execution, and that deserves some major recognition. Koala Wallop has always been one of my favorite collectives, featuring some of the most innovative and intriguing comics on the web. It has more than a few decent comics, but the three that really have always been at the top of my list were Minus, Dresden Codak, and Rice Boy. All of which have recently ended or been hiatused. In the case of Minus, an ending was always somewhat inevitable – from the very beginning of the comic, the author (one Ryan Armand) warned that the comic was only likely to last as long as he remained interested int it. With over 2 years and over 100 strips in the archive, his interest seems to have lasted longer than he expected – but, unfortunately, not long enough to keep the strip going on indefinitely. Minus was a strip about a young girl with essentially god-like powers, who used them with whimsy and with child-like innocence. It dealt with the humorous and the absurd, but could also turn unexpectedly cruel – power like that, unrestrained, can very easily have very bad results. But in the end, the truly bad fates only go to those who truly deserve it… usually. My favorite strips would probably be this one, which features the only logical response to an impending asteroid strike… and these three strips, a sequence that is immensely touching and heartbreaking at the same time. But all things come to an end – and the end for Minus was clearly coming for months. In one sequence, the work of an itinerant ne’er-do-well results in Minus losing her nature as a child, and becoming more akin to a spirit almost entirely driven by pure whimsy… and from there, the strip loses its focus. Minus wanders about, her human contacts dwindling. And, eventually, Minus accidently kills off the human race – or at least, turns everyone into ghosts. Life goes on – in a matter of speaking – but there isn’t really much farther it can go within the strip. On the other hand, Dresden Codak has been felled not by a lack of excitement, but perhaps by too much of it – Aaron Diaz, the mad genius behind this work, was in a nasty bicycling accident and is in less than great shape. Nothing life-threatening… but injured hands and a damaged computer results in a comic on delay. This is, perhaps, especially bad, given that last october, he decided to make the comic his full-time job. So long as readers keep up the purchase of shirts and prints, he aimed to make the comic a weekly strip, and even moved from his previous haphazard strips into a continuity-laden story. Of course, even before the accident, updates had grown sporadic, as the weekly goal almost immediately shifted to an update every other week – and more recently, updates on a monthly basis. It should be noted that each update is an utterly gorgeous work of art, and the series managed to retain both its intensity, as well as its propensity for occasional brilliance. But that said… even a weekly comic has trouble finding a hold in the attention-span driven world wide web, and a monthly comic is in a dangerous place indeed. Let’s hope for a speedy recovery all around – both for the creator and the created. The last strip on my mind, Rice Boy, had even greater chances than Minus of coming to an eventual end – what with being a story-driven comic with a specific end in mind. And end it did, with 439 strips to its name, and an excellent conclusion that probably shouldn’t have taken me by surprise – but did anyway. And perhaps I still would have been distraught at the ending… save that the creator, Evan Dahm, almost immediately moved on to the next project, Order of Tales. It is something of a prequel to Rice Boy – or at least, another comic placed in the same setting, only earlier in time. It is only a few updates in… but it is enough to know that I’ll be enjoying it just as I did the previous work. Which leaves me hopeful for Koala Wallop as a whole. Minus and Rice Boy have ended, and Dresden Codak is staggered and on hold… but replacements come, and not every hiatus goes on forever. The creators are the important part, and they’ve shown they are willing and able to create fascinating comics about fascinating things… and whether it is one comic or another, it seems likely they will continue doing so for quite some time to come. Damn the illusion of motion! And it was a good reminder that – hey! I have this blog, and haven’t posted in over a month. And, while I’ve always argued for the right of comics (and the commentators thereof) to go on hiatus as needed, I’ve also always said that it is still very important to maintain communication. Which, clearly, I have not done. So this post is, sadly, not here to bring you any new content today – I remain behind on my webcomic reading in general (with 500 updates waiting in the queue on Piperka). This weekend isn’t likely to help that, as I am shortly off to fly to a friend’s wedding – and while I anticipate many festivities and entertainments at such an affair, internet access and webcomics is probably not on the list. So no new content… today. Next week, there will be a new post. The week after, hopefully as well. And in the event that I am unable to maintain my weekly update, I shall make sure to at least have something as brief as this post to maintain the illusion of motion. You know how people always take about having “one of those days” – you know, where things are just constantly going wrong, you fall further behind with every moment, madness is cropping up in every direction, yada yada widening gyre, yada yada the centre cannot hold? I’ve never really had one of those days. But lately, I’ve been feeling like I’ve had one of those months. And it has been lots of little things, really – one project at work finishes up just in time to get started on a paper to write; the paper gets finished up just in time to plan out upcoming summer trips; that gets taken care of, and it feels like there is a few moments to rest, and then – hey, what’s that dripping sound? And – my, but isn’t that a large puddle of water fleeing the air conditioning unit? And- hmm, what excellent timing, what with the temperature creeping up to new and unusual heights! But the work gets done, and the paper gets finished, the trips scheduled, and the AC gets fixed… and, then it is a week later, and a whole new set of business on my doorstep. So I’ve got one of those moments of breathing room here, and am wanting to write something, and… unfortunately, I’m way behind on all my comics. I mean, this isn’t like me, but Piperka is currently telling me I’ve got a backlog of some 700+ updates and… well, the more that pile up, the harder it is to really dive back in and get caught up. I’ve been keeping an eye on my favorites, but even then, it has been more skimming through things than anything else. On the other hand, I’m almost glad I haven’t had the chance to talk about PvP. It seems like Scott has had some new twist every week, each one ramping things up to the next level in one way or another. I’ve been impressed – mainly because it has felt a natural way to make a normally somewhat static strip suddenly grow – but it feels like there hasn’t been a moment to really sit down and take stock of the new state of things. That the strip hasn’t yet fully settled down into its new status quo? Does that make sense? There’s been a lot of change, but it feels like we’re still waiting to see all the fall-out. It has been my tradition, when a Friday the 13th comes along, to try and take note of a quality webcomic in the genre of horror, and give all due recognition for such an accomplishment – horror seems to be the least represented genre in online comics, and thus it is rare indeed to find one that really works. But… this year, I find myself without any recent finds to put forward. And, as mentioned, being behind on all my comics means not knowing if any are currently bringing the scary or if it simply the usual assortment of laughs and drama. And my one real candidate, the delightfully twisted 5ideways… is currently on indefinite hiatus, with a decidedly less-than-functional website. Which is a shame, because it is was really just starting to hit its stride, and while the overall plot was still unwinding ever so slowly, the action itself had gotten to the really juicy parts. The plot is… hard to explain, but I’ll try. As far as I can tell, one day the world broke. Things went bizarre, and we follow an unlikely pair of… survivors, I suppose is the best term for them. Though they themselves may be far more than the really seem to be, or are even themselves aware of. Life proceeds onwards from there. Now, this is a very different comic from Friendly Hostility, the other comic produced by K. Sandra Fahr. Friendly Hostility, like her previous work, Boy Meets Boy, Those comics are all about relationships, really – and they have their share of intense storylines and the occasionally surreal, and they are undeniably good comics at heart… but they aren’t much different than a lot of the other comics out there. 5ideways is largely unique. It reminds me of watching certain mind-twisting anime, where incredibly dark, incredibly bizarre events are… routine, even in their unreality, which somehow makes them all the more horrifying. And 5ideways is very much the same, current hiatus or not. The fact that the most recent update ended on an especially monstrous note, and has left things dangling there for months on end… well, in many ways, it seems almost appropriate. Thus, I award my Fourth Friday the 13th Webcomic Horror Award to 5ideways, for being exceedingly casual about being very, very frightening.